Domestic Renewal; a table reset is collaborative project and exhibition curated by Rohan Nicol who commissioned 16 individuals to make objects for a table setting. The work they produced has been brought together for exhibition at Craft ACT (November 2012) Craft Victoria (August 2013) and The JamFactory craft and design centre, Adelaide (December 2013). The group has been drawn from a range of creative disciplines including Architecture, Studio Craft, Design and Visual Art practice. The objects brought to the domestic table and the manner in which they function reveal valuable insights into the way people perceive themselves, and their past, present and future. In addition the objects reflect the cultural, economic, political, social and technological settings through which they become available for ‘consumption’. This project sits within the long trajectory of similar projects by artists and designers who have been concerned with the role, and possible meaning, of the domestic object, and by extension the domestic and its encasing built environment as a mechanism of effect. 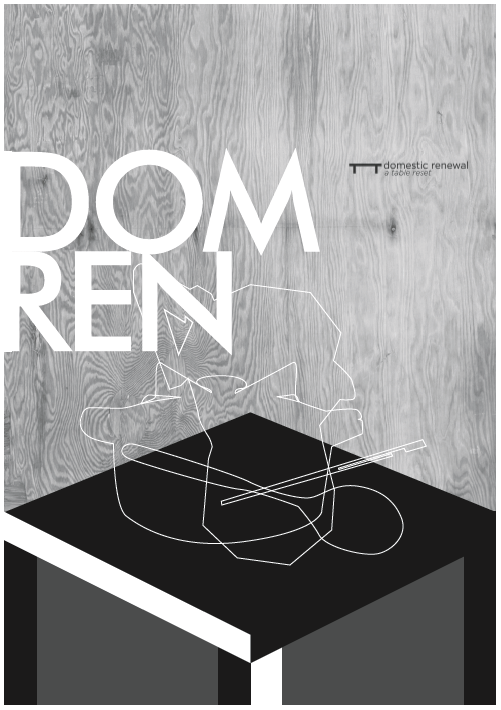 DomRen argues that craft and design practice in all its guises must recognise the complex networks and connections it has, and its practitioners need, in order to conduct an agile and situated (or local) response in ‘making’ domestic landscapes and that studio based craftspeople are in a unique position to articulate those new living models through the objects they produce.